Dr. Patel has an easy and loving manner about him. My 6-year-old loves to see him and she was never afraid, because he kept her calm and informed. The office staff is also lovely and accommodating! As hard as it might be to find a specialist for yourself, it’s even tougher to find the right foot doctor for your child. First, of course, you want to be sure that your podiatrist is specially trained in childhood foot conditions and development. But it’s just as important to find one who is calm, gentle, and compassionate with your child, and can speak to them in a way that they can understand and feel valued. Dr. Sanjay Patel is a children’s foot doctor in Milford, CT who loves working with people of all ages. There’s no greater reward than helping a child overcome their pain and develop healthy feet to last a lifetime. Feet are meant to last an entire lifetime—80, 90, 100 years or more! A healthy individual could log well over 100,000 miles over their decades of life. But most feet aren’t perfect, and they change and develop constantly throughout life. When kids suffer foot pain or start out with a congenital defect—their arches never develop, bones fuse improperly, abnormalities in gait persist into adolescence, etc.—it can set them on a long-term trajectory of injury, pain, and difficulty with healthy activities. 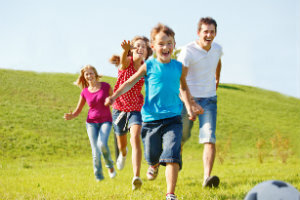 It is vitally important that kids avoid foot pain and develop healthy, active habits that persist into their adulthood. Whatever is holding them back—whether the issue is a simple, painful ingrown toenail or a complicated bone deformity—making sure they get comprehensive and complete care and can return to activities as quickly as possible is our top priority. Children’s feet are quite different from adult feet. Bones don’t fully mature until well into the teenage years, and until that point they are soft, flexible, and growing constantly. During that time, they must gain strength and master skills like coordination and balance to develop a matured walking gait. As a result, children experience very different kinds of foot pain and conditions than adults do. Although they may sometimes “grow out” of these problems, failure to treat them may lead to chronic complications that can cause pain and restrict activity later in life. Clubfoot – This is a congenital condition that twists feet in and down. Proper care can fix the deformity, which is important for preventing permanent problems that could interfere with your child’s ability to walk later. Pediatric flat foot – Many young children have low, flat arches that disappear when bearing weight. Most will develop a permanent arch by age 6 or so, but about 10 to 20 percent never do. If your child’s feet are flat, treatment may be necessary depending on the cause. Tarsal coalition – Usually noticed in adolescence, this is a problem with abnormal bone development that creates painful flatfoot problems. Gait abnormalities – Issues like toe walking, intoeing, and out-toeing are common in small children. Evaluating them is key to be sure there aren’t signs of a more serious underlying issue. Ingrown toenails – It’s common for a child’s nails to grow inward, due to injury or genetic inheritance. This can be painful, but it’s fairly easy to fix. Foot and nail fungus – Children’s feet sweat a lot, which increases their risk for conditions like athlete’s foot and fungal nail infections. Sever’s disease – This heel pain injury is common in school-aged, active children and can keep them from running and playing unless it’s treated. Ignoring it could cause more permanent damage. Stress fractures – Repetitive hard impacts can take a toll on a child’s bones if the feet are not conditioned well for their activities. Sports injuries – Accidents and overuse are common in sports. Ankle sprains, broken bones, and general foot pain can all keep your child from enjoying the sports he or she loves. Juvenile bunions – Kids and teens with predisposed feet can develop bunions, too. Treatment is important for controlling this painful deformity. There are rarer foot issues that can affect children as well, including cavus foot (high arches) and an accessory navicular. Dr. Patel is well trained in a wide variety of pathologies and can help your child get the care they need, from a foot doctor they can trust. At Family Foot Care & Surgery, we use our decades of experience along with state-of-the-art testing and diagnostic technology to properly assess, diagnose, and treat whatever is cause problems for your child. Often the treatments are very gentle and conservative in nature; small changes such as like switching shoes, using orthotics, or starting physical therapy are often highly effective. Occasionally a more aggressive treatment may be necessary. But whatever your child needs, you can trust Dr. Patel to ensure they get it, and will do everything possible to ensure that they feel as informed, safe, calm, and comfortable as possible. Let our team help maintain a strong, life-long foundation for your child! Give us a call at (203) 876-7736 to reach our office in Milford, or (203) 288-4055 for Hamden.